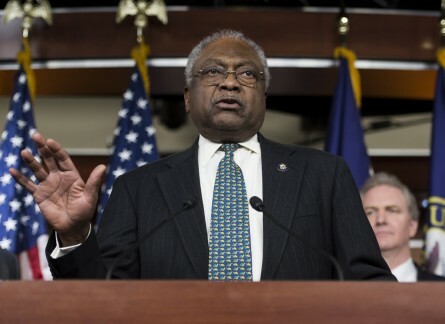 Former Rep. Joe Baca, D-Calif., insisted Assistant House Minority Leader James E. Clyburn endorsed his campaign in writing — despite a Tuesday report that the South Carolina Democrat would stay neutral in the heated 31st District primary. Earlier, Clyburn said through his spokesman, Patrick Devlin, that any reports he had endorsed Baca were "incorrect" and "he is staying out of the nomination primary." The squabble exacerbates tensions among Democrats for the 31st District — one of the party&apos;s top pickup prospects in 2014. The campaign arm for House Democrats is supporting Redlands Mayor Pete Aguilar&apos;s bid over Baca&apos;s comeback campaign there. Last cycle, Baca lost re-election to Rep. Gloria Negrete McLeod, D-Calif., in the nearby 35th District. On Friday, Baca released an endorsement list to CQ Roll Call that featured Clyburn&apos;s name prominently — as well as dozens of his former House Democratic colleagues. But this week, Clyburn&apos;s spokesman disputed his endorsement for Baca. Baca countered that Clyburn signed his endorsement sheet at an event at the National Democratic Club in Washington, D.C. This is not the first time Baca has found himself at odds with members over endorsements. In 1988, when Baca was running for a seat in California&apos;s state House, he was accused of misrepresenting an endorsement from the late Sen. Edward M. Kennedy in a mailer. The 31st District is a top target for Democrats this cycle after the party bungled the race in 2012. Under California&apos;s new top two primary, several Democrats split the vote that cycle, allowing two Republicans to advance to the November elections. As a result, Rep. Gary G. Miller, R-Calif., won the recently redrawn district that voted for President Barack Obama with 57 percent. This cycle, the Democratic Congressional Campaign Committee backed Aguilar early in a veiled effort to scare other Democrats out of the race. But at least two other Democrats — Baca and attorney Eloise Gomez Reyes — announced they are seeking the seat. While some Democrats fear a contested primary will lead to an ugly race, the DCCC says it is staying focused on making sure a Democrat advances to the general election.